The Bay 1 #25 Light Red Filter from Heliopan is designed to build strong contrast in black and white photography. The filter will make skies look more dramatic and give a tonal difference between foliage and flowers. Infrared images can also be enhanced by the filter, giving a moonlight effect. The colors blue and green are completely absorbed, which will make them darker and increasingly show more contrast. 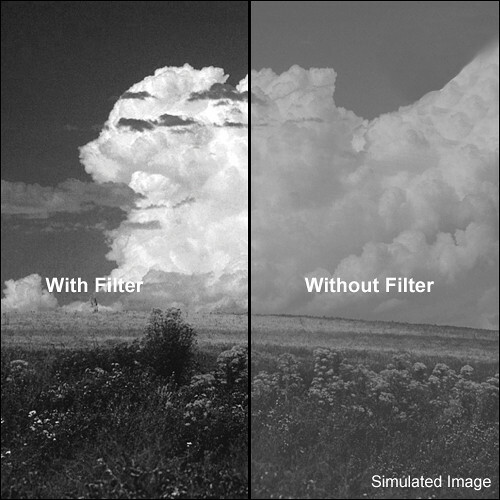 This filter will also cut and remove haze from a black and white image. Exposures should be increased by 3 stops, because of the 8x filter factor. The ring is made from brass, which will prevent it from getting stuck on the front thread of a lens because of the pliable nature of the metal. The brass ring also has front threads, so filter stacking is possible. Schott glass is a high grade of glass that is used for all Heliopan filters. #25 Light Red Filter (Bay 1) is rated 4.0 out of 5 by 1. Rated 4 out of 5 by Rum Runner from Ooozes Quality Heliopan Filters are great, I've never had an issue with any of them, and this one is no different. SUPER high quality glass, great coating, built like a tank, and gets great results. It also helps that Heliopan makes the only Bay 1 filters left, so you don't have to fiddle with an adapter. However, it's pricey. you can find better values out there, but you just won't ever have to worry about this.